This is the fourth year of the Rising Star Award, founded by the UK Green Building Council (UK-GBC) and PRP. 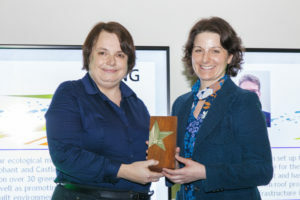 Lisa Pasquale of Six Cylinder Limited won the award for producing a practical methodology for derisking large-scale retrofit, which is used as the risk management toolkit for the GLA’s RE:NEW programme. This entry was posted on Monday, March 14th, 2016 at 12:49 pm	and is filed under AECB Member News. You can follow any responses to this entry through the RSS 2.0 feed. Both comments and pings are currently closed.